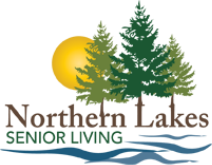 No matter how many or how few assisted living services you need, Northern Lakes Senior Living brings the services to you in a bright, well-appointed apartment you may never guess was in an assisted living community. Apartment homes come in a variety of sizes – from studios, to one-bedroom and one-bedroom plus den floor plans – and feature full-sized kitchens and ample storage. Northern Lakes Senior Living offers seniors the full spectrum of care with individual care plans tailored to meet whatever needs may arise. Assisted living apartment homes offer support services that include extra assistance with housekeeping, daily activities, medication reminders, laundry, and personalized health care plans that recognize individual needs and preferences. Assisted living also includes three chef-prepared meals a day. For more information about Assisted Living, call 218-454-2121 ​or complete the form below. Meadow S2 – STUDIO – 435 SQ. FT.